This note outlines the method for using PDXpert PLM software&apos;s server-side public views to support Altium Designer&apos;s component libraries. To allow your CAD tool to read the database, install SQL Server Express (or higher). After installation, use the PDXpert Application Server's Change Database Server button to move the existing database into the new instance. Be sure that your server's firewall and client's firewall allow communication between the CAD application and SQL Server. Applies to PDXpert PLM software releases 7.0 or later. Custom collections are available in PDXpert release 8.1 and later. This demonstrates Altium's use of the Microsoft SQL Server database on the server computer. You can also connect Altium to the client-side database using Microsoft SQL Server LocalDB; see the Altium client-side application note. Data obtained from the server has virtually no refresh delay. All public views (not just the client-side subset) can be used in queries. By assigning appropriate custom attributes to PDXpert part type templates, components managed within PDXpert can support external computer systems. In particular, attributes required by Altium Designer — such as component values, schematic symbols, layout footprints and source part numbers — can be created and managed within the PLM system. Before connecting Altium Designer to the PDXpert database, you&apos;ll first need to define custom attributes to support Altium Designer&apos;s libraries. Each PDXpert part can include an approved set of supplier parts on the Sources tab. These sources are brought into the SourceItemMasterView (or can be derived from other public views), so you should not create custom attributes that duplicate the part&apos;s source data. Where different part types have identically-named custom attributes, these will be merged into a single column. For example, if your Resistor and Capacitor part types both have a custom attribute named Value, the resistor value (say, 22K) and capacitor value (say, 10nF) are merged into the view&apos;s single Value column. This is useful because SQL Server has a limit on the total number of columns that can be presented in a view. If you want a small set of attributes that are shared across all items (e.g., Category, Value, Tolerance, Package, Library, Footprint), then these can be created within a single PDXpert Part Types collection member, say Purchase. The Category is the selector for categorizing your Altium libraries. This is a very simple system to maintain, and a useful complement to non-significant part numbering. You can also create a series of part types, each of which can have both common attribute names (like Value, Library Ref, Footprint Ref) as well as unique attributes (WVDC, Tolerance, Tempco, Gate Count, Forward Drop, Package, etc.). The part type is the selector for your Altium libraries. If you&apos;re using category-based part number prefixes, then you may already have many of the types defined. Your supplier part types can be matched exactly to your own parts&apos; types (supplier resistors use the same Resistor part type as your own resistors). However, the source&apos;s custom attributes wouldn't have much value, since they&apos;d mirror your own part&apos;s custom attributes. More usefully, your supplier parts are created from a common Source part type. For information about PDXpert software&apos;s ODBC views, refer to the help guide Contents > How to report, import & export >Using ODBC for export > ItemMasterView column reference and > SourceItemMasterView column reference topics. The PDXpert database contains many objects, but only public views (with a View suffix) and user-defined views (with a My prefix) remain stable from one release to the next. Public views in the PDXpert database provide a comprehensive set of data columns. For CAD applications, you'll only need columns that are related to part identification, CAD application support, and possibly supplier data. 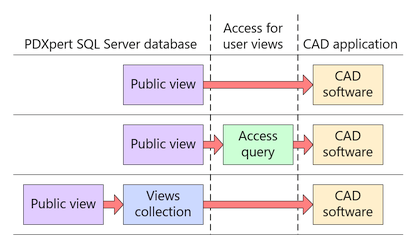 Use SQL Server Management Studio, Microsoft Access, or any ODBC client to browse the public views. In particular, examine the public SourceItemMasterView and SourcePairMasterView, which are derived from the more basic public ItemMasterView part & document list. Both views present a side-by-side listing of your company-defined parts (and documents) with one or more qualified sources. Home items include their custom attributes; these views trade off one supplier with custom attributes for three suppliers without. Do not use SELECT * in your actual queries. Always specify the exact columns required. This first example relies on a single Component part type for all CAD-related parts (e.g., resistors and capacitors), and an Altium Category attribute to group the parts within Altium. Although this part type will usually represent purchased parts, it may include custom in-house items (e.g., custom-wound chokes). Supplier parts share a common Source part type, and each source part points to its own ComponentLink details. The PDXpert SourcePairMasterView view can display one source with custom attributes, or SourcePairMasterView displays up to 3 sources for each part. Design each PDXpert view to select a specific category (and exclude parts with an empty category value). Altium treats each view as a .DbLib library table. Since all part types share the same custom attributes, the default values would all be empty at the Part Types collection, and these would be example values applied to each Component part. The custom attribute labels assigned within PDXpert don't need to conform to Altium's requirements; we use SQL's syntax [PDXpert column] AS [Altium label]. Columns can be re-ordered as needed. Also note that CAST([Datasheet URL_Child] AS nvarchar(250)) limits the length of the ComponentLink1URL link. This alternative creates one Part Types collection member (Capacitor, IC, Resistor, etc.) for each Altium part library. With a more detailed set of PDXpert part types, you can include custom attributes that are specific to each part type. In addition, there's no need to create a category custom attribute, since we'll be selecting records based on the part type's name. Again, all supplier parts share a common Source part type with its own datasheet link that becomes the Altium ComponentLink data. This example demonstrates that the source part can also have an independent set of custom attributes. However, simply adding the source's datasheet URL as an Item Files external link is usually better practice. Create a few components for testing; in the following diagram, home part 100043 is sourced from partner Rohm. After all part types have been defined, create the Views collection members for Altium. In the following example, a user-defined view (MyResistors) uses the PDXpert public view SourceItemMasterView (to get the Prt and its sources). 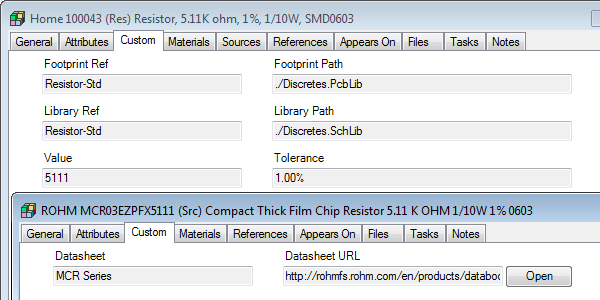 It's joined with an ItemMasterView for Src1 and Src2 (to get the two sources' custom datasheet details). A few columns are selected from part records with Type=&apos;Resistor&apos; (this assumes the type is only applied to your own organization's parts). All data is CAST() to ensure it's usable by the Altium ODBC connector. Again note that custom attribute labels assigned within PDXpert don't need to conform to Altium's requirements; we use SQL's syntax [PDXpert column] AS [Altium label]. Columns can be re-ordered as needed. And, CAST(SrcN. [Datasheet URL] AS nvarchar(250)) limits the length of the ComponentLinkNURL link. After you've constructed the first view, the views for other Altium libraries, such as MyCapacitors for the capacitors library, are quite similar. Specifically, use the appropriate part type custom attributes for each library (such as [Voltage] instead of	[Tolerance]) and apply the correct part type filter (e.g., WHERE Prt.[Type]=&apos;Capacitor&apos;). There are several alternatives for attaching Altium Designer electronic CAD application to the PDXpert database. The simplest, although more limited, method is to connect Altium Designer directly to the PDXpert public views. All data would be selected using the Field Settings to define the matching criteria. From within Microsoft Access (or similar tool), link the PDXpert public view(s) as an ODBC external data source. Create the queries required by Altium Designer and then attach Altium to these derived library views. Create PDXpert Views collection member(s), which overlay the PDXpert public database views, using SQL Server Management Studio (SSMS). The views appear as normal tables to Altium. If you&apos;re comfortable using SSMS to access a SQL Server database, this approach is powerful, flexible and simple to maintain. SSMS is included with higher-end versions of SQL Server, and a free Express version can be downloaded from the Microsoft website. Test your Altium performance before using these techniques. PDXpert 9.0 (and later) materializes public views, which reduces the time required to execute user-defined views. Altium may also change their code in later releases to eliminate time-sensitive queries. Altium has some quirks related to data search and retrieval, and you may need to optimize data access. lets you drag a selected part from the results list. Unfortunately, Altium appears to make redundant queries for select and drag. That is, rather than using the results from the initial search, on row selection the database is re-queried, and at the start of the drag re-queried again. While the initial search (step 1) usually offers acceptable performance, steps 2 & 3 can have annoying delays. A query to SQL Server is expensive: each part row is a join of the item, custom attributes, current revision with a link to Sources list, and collection tables (such as owning organization, type, lifecycle, UOM, etc.). This is presented in a public view, then filtered by your user-defined part list view, and finally delivered across the network. Depending on the amount and complexity of your data, this can take many hundreds of milliseconds — perfectly acceptable for search results but unacceptable for real-time drag-and-drop. Altium has confirmed that this problem is common to any data store that's not a simple Access/Excel table on the local machine. Throwing hardware or high-end databases at the problem isn't going to solve it: for remote database sources, Altium advises users to create a static table that's refreshed periodically. A materialized view is a database table that contains a snapshot of a view, after all joins have been performed. In PDXpert 9.0 and later, all public views are materialized. Item joins to lifecycle, owning organization, trustee, unit of measure and other collection tables are resolved and saved in the materialized view. User-defined views remain dynamic. Depending on your SQL Server edition, system load and network latency, this approach may provide near real-time performance. Connect the ODBC client to the PDXpertDB database, as described in Contents > How to report, import & export > View & export via ODBC > Create an ODBC connection help topic. If the mouse select-and-drag performance is acceptable, you're done! This procedure must be assessed and possibly modified by an IT specialist to accommodate your specific hardware and software environment. Code examples are provided for use at your sole risk, may require modifications and should be thoroughly tested before placing into production. If SQL Server's query performance is inadequate for real-time response, then create a PowerShell script to transform each dynamic administrator-defined (My...) view in PDXpertDB into an equivalent static table. These materialized views must be saved in a new PDXpertDBStatic database. Schedule a Windows task to run this script (Copy-PDXpertMyViews-Static.ps1) every, say, 10 minutes. A second script (Run-CopyPDXpertMyViews.ps1) may be used to kick off the scheduled task asynchronously, to force an immediate refresh. The layered permissions of Windows, the PowerShell executive and SQL Server may require some user account tweaks. We've written two prototype PowerShell scripts along these lines, which you're free to modify and use. Settings: Allow task to be run on demand. If the task is already running, do not start a new instance. Any time you upgrade PDXpert, you should disable the scheduled task so that it can't run during the upgrade. Based on initial testing, Altium's response on part row selection becomes quite acceptable, under 500 ms, even across a network. For maximum efficiency and to minimize the table refresh period, you may wish to use a single user-defined view for all part data, and filter the results within Altium using a custom attribute for part category. Although using static tables is Altium's recommended approach, it's not perfect. There is latency from when a part record is created/changed in PDXpert to when it appears in the static table. There are also times when the data is unavailable — the brief period when a static table is dropped and replaced by the updated table. More frequent refreshes increase the load on SQL Server and the chance of an Altium search hitting the replacement period. We suggest starting with 10 minute refreshes, which yields an average 5 minutes latency and < 0.2% data unavailability. PDXpert server relies on total ownership of the \Data\ folder, and therefore the script creates the PDXpertDBStatic.mdf/.ldf database files within a \Static\ folder parallel to the \Data\ folder. The previous solution has several advantages: the parts list is updated in near real-time and all Altium users are looking at the same data. However, the solution requires some experimentation with SQL Server and PowerShell. If you only have a few Altium seats, it may be simpler to periodically export the parts list as a CSV file, and distribute that to Altium users for use on their own machines. After creating the query for your user-defined view, create a new Data Transformations member and copy the SQL statement into the <sql></sql> tag, as described in the Creating a custom Data Transformation help topic. Whenever an updated parts list is needed, run the Report/Export Wizard to export your data into a CSV file. To connect Altium Designer to SQL Server using ODBC, refer to Altium's help topics (for example, Using Components Directly from Your Company Database) or contact Altium for technical support. The following ideas are provided as a useful starting point. You&apos;ve created your part types and defined their custom attributes, and designed the queries to extract your component data. Now connect Altium Designer to the selected ODBC data source using a Database Library (*.DbLib) file. If you&apos;re connecting directly to a PDXpert database view, you&apos;ll likely select the Use Connection String option. Altium appears to work well using the OLE DB Provider for SQL Server since this apparently excludes the schema from the library name. Your queries will need to be reviewed, and possibly repaired, if you make changes within the PDXpert collections. For instance, the example SQL statement will fail if you remove or rename a custom attribute, or rename the Resistor part type. Make changes to your PDXpert collections cautiously to minimize reworking your user-defined views. Finally, it bears repeating that your SQL queries must only extract data using SELECT statements. Do not attempt to update or delete data within the PDXpert database. Access, Excel and Microsoft are trademarks or registered trademarks of Microsoft Corp. Altium and Altium Designer are trademarks or registered trademarks of Altium Limited or its subsidiaries.